When I saw that Mellanox was presenting at Networking Field Day 17, I was definitely curious. When I found out that I would in fact be watching a joint presentation by Mellanox, Cumulus Networks and Ixia, it is fair to consider my interest piqued. Why would these three companies present together? It turns out that these three companies present quite a compelling story, both individually–as you would probably expect–but also when used in combination. This post looks at the role of Mellanox Ethernet switches in an Ethernet fabric. To me, Mellanox has been one of those ‘behind the scenes’ companies whose hardware is all over the place but whose name, in Ethernet circles at least, is less well known. 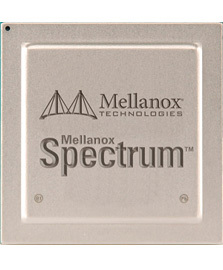 Storage and compute engineers on the other hand are likely more familiar with the Mellanox name, especially in the context of Infiniband switches and network interface cards (NICs). In 2016 Mellanox acquired EZchip, allowing the development of some very capable Ethernet switches and an expansion of the company’s portfolio; to paraphrase Amit Katz (VP, WW Ethernet Switch), Mellanox connects PCI-Express interfaces together by building NICs, cables and switches. At the Networking Field Day event in February 2018, Mellanox proposed that most of the layer 2 switching protocols offered today to solve load distribution and loop prevention issues are irrelevant and suggested that EVPN/VXLAN was able to do everything the data center needed without having to use protocols like TRILL, Spanning Tree, SPB and so forth. More specifically Mellanox offers a broad range of 10/25/40/50 and 100Gbps Ethernet switches based on their Spectrum ASIC which support VXLAN without requiring packet recirculation (i.e. VXLAN routing is accomplished in a single pass through the ASIC). Mellanox’s own NOS, MLNX-OS (now Mellanox Onyx) supports OpenFlow 1.0 and 1.3. 10, 25, 50, 100Gbps support throughout the switch range. 40 Gbps on at least one model, but then, is anybody really looking at 40Gbps any more? For sure, this chart is produced by Mellanox so will undoubtedly focus on areas where the Spectrum thoroughly trounces the Tomahawk and Trident 3, but it’s effective, don’t you think? There is also a Tolly report commissioned by Mellanox which can be downloaded after registering, comparing Mellanox Spectrum and Broadcom Tomahawk based switches in the context of packet loss and low latency. This claim is a direct reference to data from the Tolly report. I do not have permission to reproduce content from the report here but if you register to download the report, the exact figures are shown in Table 1, on page 5. Equally curious are the results which show what traffic gets dropped when an output port is oversubscribed. While the Mellanox Spectrum ASIC shows lost frames spread equally across all the contributing input ports, the Broadcom Tomahawk results at times show a very strange and unequal distribution of packet loss, favoring the forwarding of frames from some input ports over others. This is probably not what we, as consumers of the technology, might have assumed would happen. Mellanox made a pretty strong case to consider its switches when building a white box based Ethernet switching fabric. But what of Ixia and Cumulus? I will address these companies in subsequent posts.